This morning I noticed B’s peonies had begun to open up and bloom. I made a note to myself to take a few photos and send them to her. Peonies are some of her favorite flowers, her mother’s, too. I did better; posted them to Facebook and then it dawned on me to share them even farther: here. I hope it cheers B and her mother up. It put a smile on my face. W just finished mowing the grass and O is at a friend’s house swimming. I have a stack of papers to grade and tomorrow’s lessons to tighten up – it’s the end of the year and my students are counting – we are down to six and a half. I am working to make them count. I always have and always will, but it is more challenging at the end of the year because part of me realizes that much of my job as a teacher is finished and they have changed me almost as much as I’ve changed them. 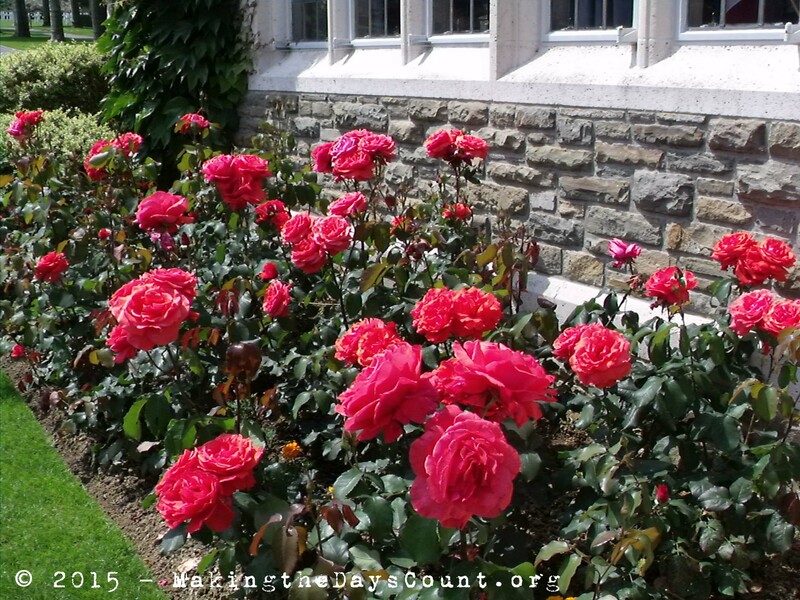 It is difficult to believe, but this place – MakingtheDaysCount.org turns five tomorrow. I started the blog on a lark – and, believe me it was a lark – the day after school ended in 2010 – school ended earlier that year and I have been writing since. Peonies also take me back to Aisnes-Marne and the late spring flowers of northern France. B loves to clip peonies and bring them inside, but she’s out of town and will be home tomorrow, or the next day. She’s where she’s needed and looking out at the flowers will have to do, for now. In time. My dad would say, “Mon Dieu, what has happened to the time?” once again, a short post has turned into a trip down memory lane and if I am not careful, the sun will set and I’ll still have a stack of papers and still have work to do. Today was a wonderful day, tomorrow could be a million and six times better, but for now I have today and I’d better jump up, jump in, and seize what remains of the day. Making the Days Count, one day at a time, one blossom, one flower, one smile. What kinds of flowers make you smile and bring back pleasant memories? Happy Blogiversary! Great pictures you posted. These flowers are so pretty, I don’t have much of a green thumb, but I do enjoy it flowers. Daffodils make me happy. Any post with pics of flowers always makes you stop to appreciate stuff. Thanks for posting. Have a great week! Thank you so much. Sometimes I get so busy, I forget to stop and take in the beauty around me. The week was gone before I knew it and the weekend is here. Next week looms large – enjoy your weekend and the new week ahead. My mom has peonies. They are such beautiful flowers, but ours were always full of ants. I remember having to give them a good shake before bringing any inside, and we’d likely miss one of two! We have the same problem – evidently the ants help the blooms open – at least that’s what my wife tells me. She’s the gardener, I am just the strong back in the operation. Even with a couple of ants, the blooms sure are pretty. Thanks for stopping in. Have a great week. I just bought a peony plant, and I’m hoping to get it in the garden soon! I bought it on a lark when I was purchasing plants for my butterfly garden. I think I’m going to put the peony by the front door, as the fragrance is unbeatable. Tulips and lilacs make me swoon, too. I love the smell of spring, as much as I love the smell of autumn. Your peonies are lovely! Thank you for stopping in and smelling the flowers. The peonies are indeed beautiful. I know you’ll enjoy the flowers when they bloom – they are amazing. Have a wonderful week. Your peonies are beautiful! Growing up in the Midwest, I also have a soft spot for peonies. They lined the driveway of my childhood home and I haven’t lived anywhere else that had them in the yard until we moved to Nebraska a few years ago. Thanks for stopping by my blog and following. I love the reason you started blogging and look forward to reading your posts! thanks for stopping by – the peonies are pretty and there are more today than there were Thursday – my wife is heading home today and she’ll get to pick a few to bring inside. after I posted the pictures to Facebook she texted me to say I had missed the salmon peonies in the front yard – I took two more photos and updated the post. Thanks for the follow – looking forward to following your adventures, too. Have a great week. Thank you stopping in and smelling the flowers, so to speak. 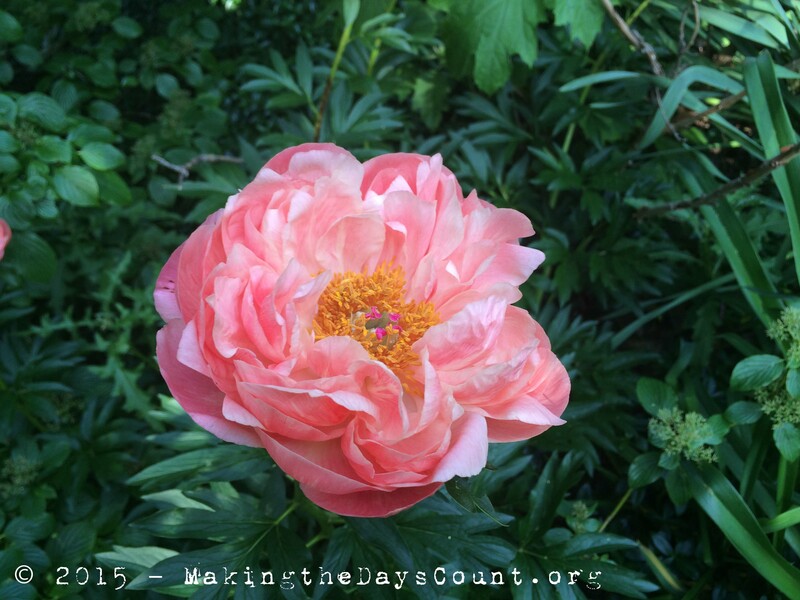 Growing up in Texas I never knew of peonies – they are a beautiful. Take care and I look forward to following along at pauses and clicks. Have a wonderful week. I must be doing peonies wrong. We have some in our yard, but they never look as good as the ones in the photos everyone has been posting. Yours are especially beautiful. Mine always fall down as soon as they bloom, and flowers just aren’t pretty upside down on the ground. Today, school finally ended for everyone in our family. We definitely made the day count, hanging out with friends in the afternoon and going to a fun picnic at the soccer fields in the evening. I hope your wife will be back soon to admire her flowers in person. Thanks for stopping in – my wife bought peonie rings that keep them upright. The flowers get so heavy they fall down, especially after rain. And, if it rains too hard it sort of obliterates the delicate flower. More bloomed Thursday and into Friday and she shared the photos with her mother. I brought a smile to my face. There will be more flowers in the gardens this year and each brings a new smile. Have a great weekend and enjoy the start of summer – the days between June and August always go much faster. Your wife’s peonies are gorgeous. Hope they helped you get through all those papers. Sounds like your mother-in-law has recovered from a setback? If so, hurray. Happy last six days. Thank you – I got through a few and planned Friday’s class – physics and astronomy review. I have tests planned for Tuesday in both classes and have a few more papers to grade today and tomorrow. It’s a good thing it’s gently raining or I’d be outside enjoying the weather. as for my mother-in-law, she fell in September and has been in a nursing home since – my father-in-law passed away last summer – she’s coming home where she wants to be, but she needs 24-hour care. That’s why my wife went home and her sister joined her Thursday – to help where she can. It weighs on my wife something awful. It’s like the book you we got when my son was born – Love your Forever by Robert Munsch. Thank you – have wonderful week. Thanks Coleen – I had the ‘counting vs. making the days count’ discussion with my eighth graders yesterday – they don’t realize how much I look forward to summer. It’s a time to reboot and prepare for the coming year. Flowers bring a color to the garden and bring it to life. We have daisies up north at our neighbors – they are beautiful and timed just right. have a great week and thanks for stopping in. Oh yes, I love peionies too. I have a May birthday so I think of them as my personal flower. No, wait, perhaps wisteria… or lilac… but then, why choose when I can have them all? And happy birthday to you, ‘Making the Days Count’. I look forward to your having many cheerful anniversaries. Margaret – I love the colors of the seasons – spring with its bright colored flowers – emerging at different times. Summer has its own style, too. I am just enjoying taking it one day at a time – making each day matter. And thank you for the birthday wishes – it’s funny how it all began and I NEVER thought it would last this long. In fact, I didn’t have a plan for what to do after the first summer was over and had to re-invent myself and the blog that first year. I enjoyed getting to know many new people who I would never have met with out MakingtheDaysCount.org – have a great day and wonderful weekend. Thank you Ingrid – summer is almost here, but the temperatures are going to drop tonight and the high tomorrow will be in the low 60s. You must have amazing views – enjoy the wild mountain flowers and take care. Have a great week and wonderful summer.